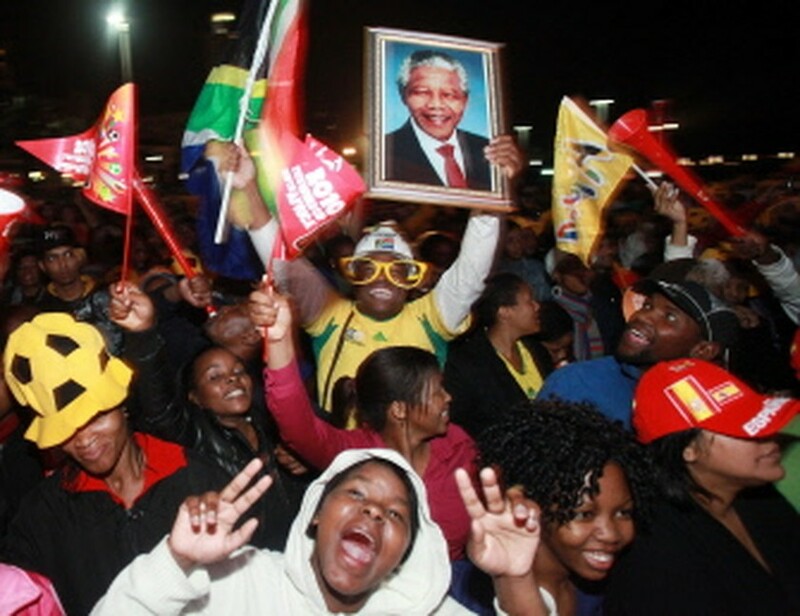 JOHANNESBURG, July 12, 2010 (AFP) - Nelson Mandela joined the football party for Spain's 1-0 World Cup victory over Netherlands with 700 million people watching, a smiling reminder that his country was in it for more than the game. For just a few minutes, the 91-year-old Nobel laureate was the centre of the monthlong show, winning rapturous cheers as he rode with his wife Graca Machel around the field at Johannesburg's Soccer City. "It's the most important thing to ever happen to this tournament," Nathaniel Nyika, a 32-year-old investor, said. "It's just a tear-shedding moment. That's an ecstatic moment." He was among the 84,490 fans packed into the stadium on the outskirts of Soweto, once a hotbed of resistance to white-minority apartheid goverment, where holding a major sporting event was unimagineable 20 years ago. For South Africans, the enormous national pride at hosting the continent's tournament has long shined brighter than the football stars. At an event that is more about marketing and television images, organisers speak earnestly and often about sport bringing together a country still divided, often by race but always by gaping chasm between rich and poor. President Jacob Zuma said the World Cup brought "priceless" benefits for bringing South Africans of all races into the stands. "To just present a new South Africa that we dreamt about when Mandela walked out of prison in 1990 becoming a reality in 2010, and that was special," said the top organiser Danny Jordaan, also a veteran of the struggle against the white-minority apartheid regime. "The contribution to this society is the new sense of pride, walking tall and being united," he said. "This World Cup created a platform for South Africans to sit together and discover their own sense of pride and their concerns and their hope for the future." The spirit of South Africa's first black president has loomed large over Africa's first World Cup, which has been repeatedly compared to the national euphoria that greeted his release from an apartheid prison 20 years ago. South Africa has delighted in proving wrong sceptics' fears about the host country's ability to pull it off. More than 40,000 police were deployed to allay fears about crime. In a nation busily overhauling its dated transport system, new high-speed rail, highways, buses and train stations greeted the hundreds of thousands of foreign fans -- systems so new that many South Africans did not know how to use them. FIFA says overall attendance at all World Cup matches has topped three million, only the third tournament to do so, and predicts the television audience will top 700 million with live broadcasts in 215 countries and territories. Colombian superstar Shakira performed her World Cup anthem "Waka Waka" on the field, which was transformed into a giant screen used to project a highlights reel of the tournament's best moments. More than 700 performers showed off the nation's varied musical heritage, from jazz to urban hip-hop, while giant elephant puppets glided across the field. While South Africans braved their winter cold, Spaniards packed into plazas draped in red and gold in blistering summer heat to watch the game on massive screens, one of them 60 square metres (650 square feet) on the Plaza Cibeles. A thunderous roar erupted across Madrid, with fans dancing in the streets and chanting "Viva Espana!" as the country's first-ever World Cup trophy sparked a nationwide fiesta. The centre of the capital was a sea of the red and gold national colours as Spain celebrated its agonising 1-0 extra-time win with 150,000 fans watching on screens set up Madrid's main thoroughfare. The deafening sounds of cheering, klazons, firecrackers and cars horns rang out across the city as the World Cup's perennial underachievers won the trophy in their first appearance in the final. Amsterdam, which had to urge people away from screens in an overcrowded central plaza, fell silent as about 180,000 fans watched their loss in disbelief. As the final whistle blew, the earlier festive atmosphere turned somber and a cacophony of vuvuzelas suddenly died down. 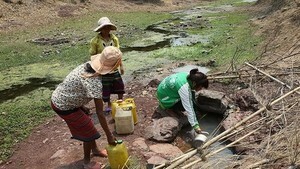 Some cried, others sank down to the ground; many started leaving the square in grim silence. But Spanish fans at the stadium in Johannesburg were exuberant. "I feel so fortunate not only for Spain to win the World Cup but to be here to see them," said Sergio Gonzalez from Madrid.